alaTest has collected and analyzed 14 reviews of Espressione Cafe Retro Espresso Maker - Red. The average rating for this product is 3.7/5, compared to an average rating of 4.4/5 for other products in the same category for all reviews. Reviewers are impressed by the durability and reliability. The maintenance and design are also mentioned favorably, but the capacity and size get negative comments. We analyzed user and expert ratings, product age and more factors. Compared to other products in the same category the Espressione Cafe Retro Espresso Maker - Red is awarded an overall alaScore™ of 78/100 = Good quality. I can't think of a thing that could be made better (other that the water tank). 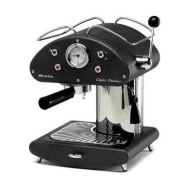 very nice espresso machine for the price. makes a great shot and good steam for cappuccino. works pretty good with pods too. Fun and easy to use. Mine has lasted over a year now, and no problems. I did strip the frothing wand, and had to get a replacement. I took it off to clean, every time I used it. most likely something I should have not done. Only HEADACHES after six months!!! I wanted to share with others what I wish I had known before I bought this machine. If I had known these things, I wouldn't have bought it. Unfortunately, there are a lot of fake reviews out there, which I read before buying, so beware!